As part of its strategy to develop renewable energy projects, the European industrial initiative Dii (Desertec industrial initiative) plans to promote the implementation of several large-scale projects in the MENA region (Middle East North Africa). The realization of these projects requires the establishment of a set of technical and regulatory prerequisites. Dii intends to carry out a prefeasibility study for the implementation of a 1000 MW Renewable Energy pilot project, in Tunisia. Tunisia's ambitions and Dii’s objectives may converge to promote projects of mutual interest. In this context, this study is enrolled to investigate the potential of renewable energies for electricity production intended for national consumption, in Tunisia, as well as for export to the EU. The objective of this study is to prepare the basis for a prefeasibility study for 1000 MW solar and wind power plants (400MW CSP, 300MW PV and 300MW Wind) that Dii will elaborate afterwards. 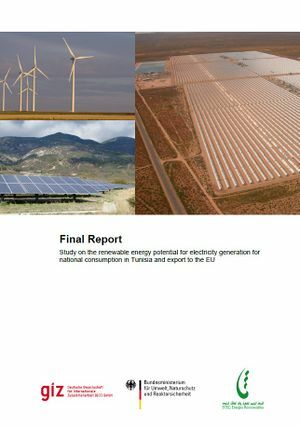 While performing this study, initially planned for a 500MW pilot project, it turned out that it was possible without major constraints to develop a production capacity of 1000 MW, according to a timetable to be agreed upon, but that could be spread over the period 2014-2020 (some projects may be included in the Tunisian solar plan, being reviewed). In fact, a study on the Tunisian electrical grid jointly conducted by CESI and Dii has shown that the network extensions and reinforcements scheduled by STEG by 2016, installing 1000 MW of ER, even if 80% of the electricity produced would be dedicated to export (the worst case for network management), would require only minimal network reinforcements. Moreover, such generation capacity may itself justify the installation of a trans-Mediterranean cable. This page was last modified on 29 July 2014, at 10:33.